Her enthusiasm for the season translates into some of our clients’ favorite recipes. Our Pumpkin and Coconut Soup with Serrano Chili Oil (recipe below) can be served as soup shooters, or as a starter at a dinner party in place of a salad. “This is a lovely dish that feels super filling, but is completely vegan!” Chef Amanda also loves the return of fresh cranberries that pair well with a Whole Mustard and Hazelnut Crusted Pork Loin, or in a dessert preparation like the Pumpkin Trifle. 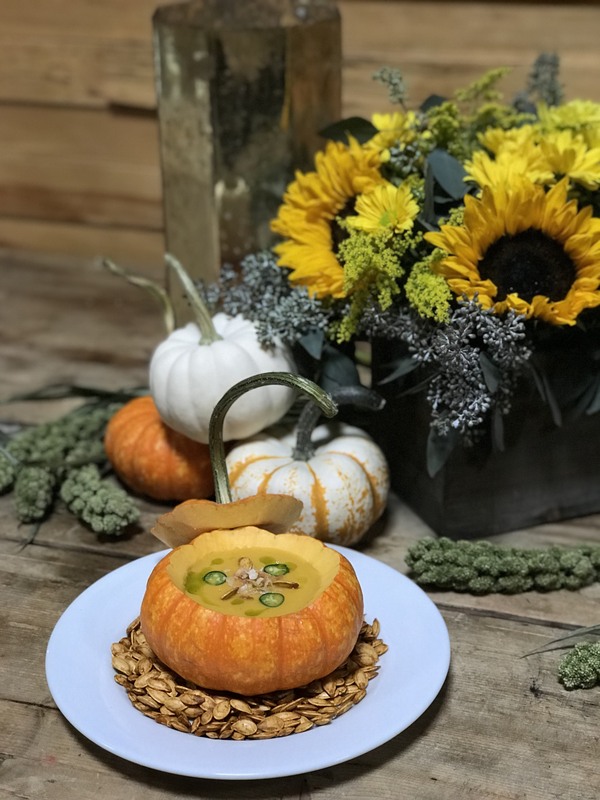 If you are planning an event this fall, let Chef Amanda and the Culinary Team at Herban Feast bring their seasonal inspiration to all your favorite fall foods. Contact marketfresh@herbanfeast.com for more information. Preheat oven to 350 degrees. Line a sheet pan with parchment paper or foil and spray with some pan spray. Wash the sugar pumpkins and cut in half removing the seeds. Season the pumpkin flesh with salt and place face down on the lined sheet pan. Roast in the oven for about 40 minutes. While the pumpkins are roasting, dice the onion into small pieces and mince the garlic. In a large soup pot, heat the olive oil over medium-high heat. Add in the diced onion and cook for 5-8 minutes. Once the onions are translucent, add the minced garlic to the pot with the onions and cook for 2 more minutes. Add the white wine and stir, being sure to scrape any of the onion from the bottom of the pan. When the pumpkin is done (you should be able to stick a knife into the skin and have it go through easily), take the skin off of the outside of the pumpkin and add the pulp into the pot with the onions, garlic and wine. Then stir in add in the vegetable stock, yellow curry paste and a good sprinkle of salt. Simmer on medium low heat stirring occasionally for about 10 minutes. At this point, take about half of the mixture from the stockpot and add into the blender with one can of the coconut milk. Blend until completely smooth and add in a fresh pot. Repeat this step again with the remaining mixture. When all the soup is pureed, add the rice wine vinegar and season with salt to taste. Top with Serrano Chili Oil and serve.